I’ve said this before, but its worth repeating… I LOVE TODD NAUCK’S ARTWORK! Something about his superhero style really speaks to me. It’s light-hearted, dynamic, and just darn enjoyable to look at. If you are unfamiliar with Todd Nauck, he’s well known for his artwork on titles such as: Amazing Spider-Man, Friendly Neighborhood Spider-Man, Guarding the Globe, Young Justice, his own creation Wildguard, and many others. Check out this fantastic red pencil warm up sketch Todd recently posted to his deviantART page! Kirby Krackle!!! So freakin’ great! 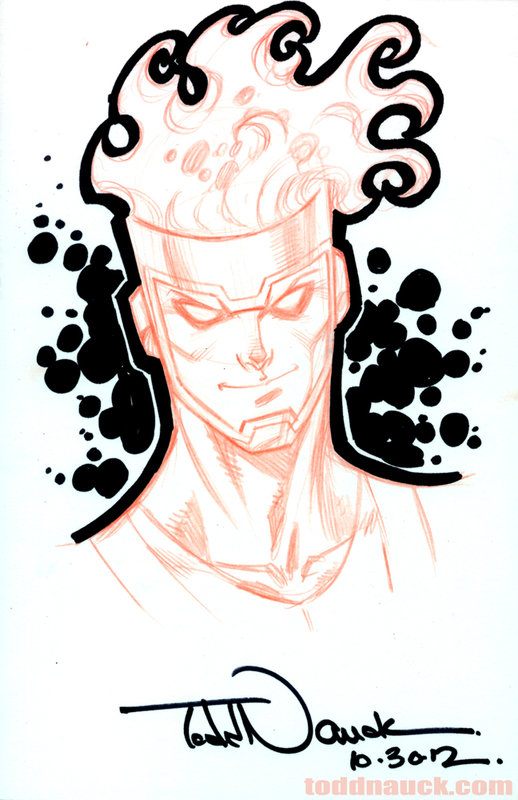 For further Todd Nauck Firestorm artwork, click here and click here! My thanks to Match-head Oscar Olalde for directing me to this awesome sketch! If you are interested in keeping up with Todd, visit him on: Twitter, Facebook, deviantART, and his own website! Support Firestorm (and Todd Nauck)! Fan the flame! Kool sketch. I loved Todd’s work on Young Justice. He became a favourite artist of mine! I miss that book.